Jars are vessels constructed using plastic or glass that store foods, household materials, flowers and much more. Plastic jars usually include plastic screw-top lids that can easily be tightened with a clockwise motion and loosened with a counter-clockwise motion. Sometimes jars are difficult to open, but there are simple techniques that can help you loosen stubborn lids. Grip the body of the jar with one hand. Place your other hand on the lid. Cup the lid firmly and rotate the lid counter-clockwise until the lid is removed from the jar. Move to Step 2 if the jar won't open. Run warm water on the plastic jar's lid. The warm water will help the lid expand and loosen a stubborn seal. 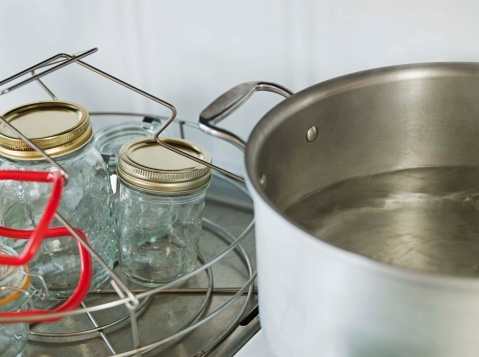 Place the jar on a secure surface and rotate the jar's lid in a counter-clockwise motion to remove. Move to Step 3 if the jar won't open. Wrap a rubber band on the plastic jar just below the lid to prevent your hands from slipping. Rotate the lid in a counter-clockwise motion to remove. Move to Step 4 if the jar still won't open. Pour 4 oz. of vinegar into a microwave-safe glass and microwave on high for 40 seconds. Turn the plastic jar upside-down and pour the warm vinegar over the plastic jar to help expand the jar's lid and lubricate the grooves that hold the lid in place. Turn the jar right side up, place it on a secure surface and turn the lid counter-clockwise to remove the lid. Repeat these techniques as needed until you are able to open the plastic jar. Kathryn Milner is a professional writer of instructional articles currently residing in Pennsylvania. Her work appears on various websites, specializing in home improvement, medical concerns and nutritional conditions that affect everyday citizens.